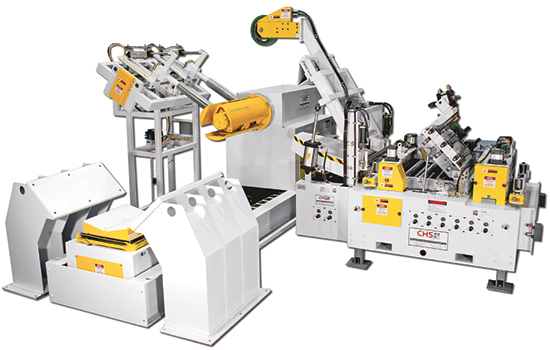 CHS Automation/ Pneumatic Feed Service, Roseville, MI, will feature a DRFS-530 servo feed-straightener combination unit with a seven-roll pull-through straightener, powered pinch rolls, powered passline adjustment and piloting straightener design. A high-lift upper bank eases cleaning. The feed-straightener is a part of a complete 20,000-lb.-capacity by 30-in.-wide spacesaver coil-feed line and includes a Bosch-Rexroth/Indramat Indramotion servo control RFX platform. Also in the booth, Pneumatic Feed Service will showcase a remanufactured servo-roll feed. Only half of the machine will be reconditioned, to illustrate the firm’s used-equipment reconditioning capabilities.